Hin Muang is a bit like the sister of a queen. It has plenty going for it, yet everyone talks about ‘the other one’. Hin Muang sits just a few hundred metres away from Hin Daeng, which breaks the surface of the sea during lower tides. Hin Muang is permanently submerged, but divers don’t come all this way to see what’s above the waves, anyway. 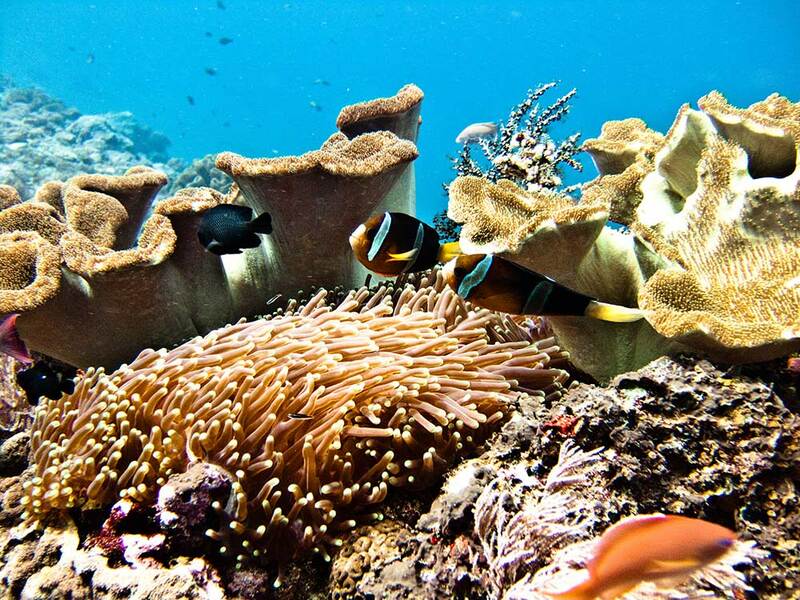 Underwater, these are two of the best three dive sites in the whole Kingdom of Thailand. The location and lack of any land within view makes one feel rather exposed out here, 50 kilometres southwest of Koh Lanta. Clarks Anemonefish (Amphiprion Clarkii) Photo by Ilse Reijs & Jan Noud HuttenGetting to Hin Muang is either done by daytrip speedboat from Koh Lanta, or by liveaboard diving cruise, where passengers sleep on the boat for several nights, diving three or four times per day. The diving here is easily good enough to enjoy these two large and deep dive sites all day long, timing each dive to take best advantage of the sea conditions. The fact that Hin Daeng gets all the attention is mainly down to the fact that naming both together is too much bother, so one of them has to miss out. In truth, there’s little to choose between these fantastic Thai diving sites. 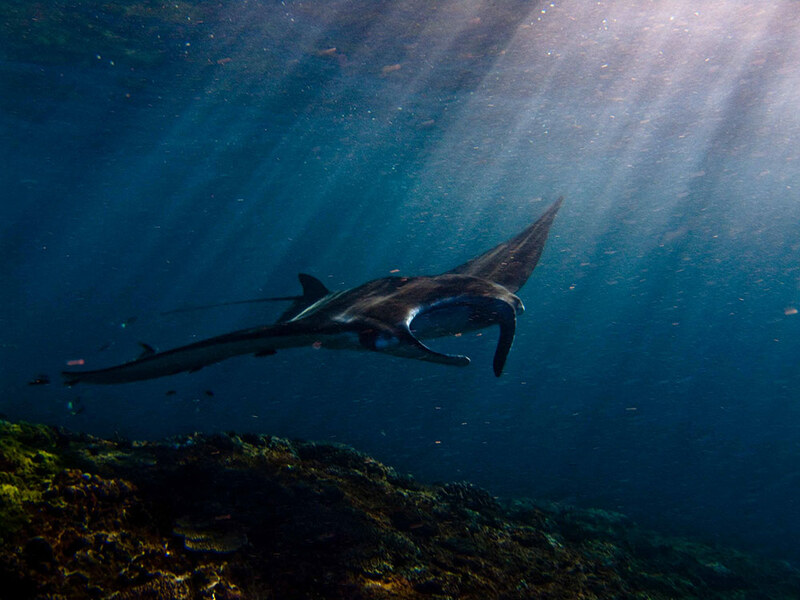 Manta Ray (Manta Alredi) Photo by Ilse Reijs & Jan Noud HuttenThe most important things to consider when planning on visiting Hin Muang are the sea conditions and the diver’s level. It’s deep, there are currents, and waves at the surface are common due to the lack of any land nearby. It’s not really suitable for newly qualified or inexperienced divers, although not unheard of for them to dive here and enjoy the experience. It’s also not the cheapest place to visit, taking into consideration the distance and national park fees. However, for those who can and do dive here, it really is fantastic! Hin Muang is a long seamount sitting in an east-west orientation. Its name (meaning ‘Purple Rock’) was given to it for its covering of purple corals and anemones. Its shallowest point is at a depth of about 6 metres, making safety stops more interesting than many other deep dive sites. It’s more than 200 metres from one end to the other and it is ideal for mult-level dives, starting as deep as one dares. It is also reported to have the deepest vertical wall drop off in the whole of Thailand. One side of this undersea rock drops down more than 60 metres, and in the often crystal-clear waters, it is truly something to behold, even without a fish or invertebrates in sight. 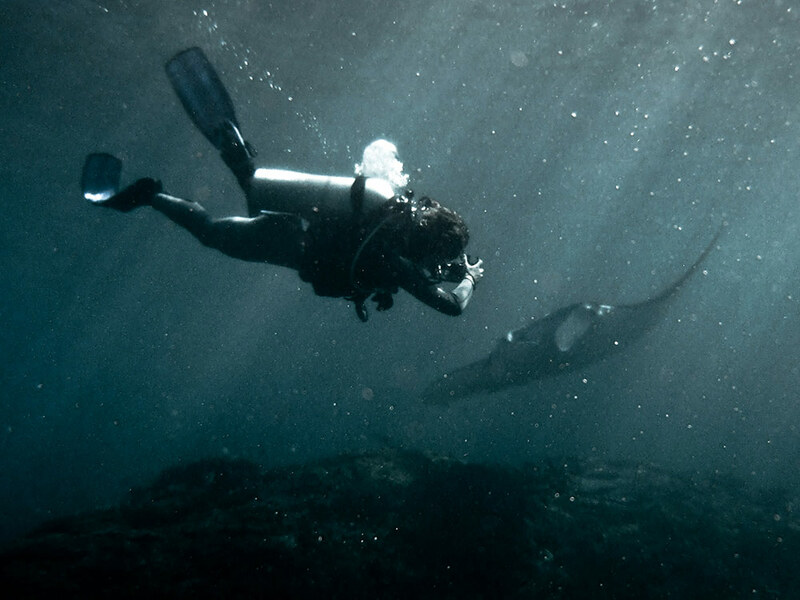 Diver and Manta Ray (Manta Alfredi) Photo by Ilse Reijs & Jan Noud HuttenDivers don’t just come to Hin Muang to look at the scenery, though. They come here in the hope of seeing something big. This is one of the most likely places in Thailand to see a Whale Shark (Rhincodon typus) or Manta Rays (Manta alfredi). Although they are by no means guaranteed, sightings at the right time of year (February-April) are quite common. The other marine life here is very much like the rest of this part of Thailand, with Moray Eels (Gymnothorax), Lionfish (Pterois), small and mid-size sharks, Barracuda (Sphyraena), and Tuna looking to feed on smaller reef fish and invertebrates. The corals, sea fans and anemones tend to be in excellent and healthy condition, most likely due to the millions of litres of nutrient-rich waters which pass by each and every day. Hin Muang is not suitable for snorkelling, learning to dive, or night dives, but for a challenging day dive, and the chance of seeing something large and special, there are few better places in Thailand. Divers just need to be honest with themselves and their Divemasters, and keep an eye on their air consumption as much as they do the deep blue sea.